UPDATE: Bombardier stock (TSX:BBD.B) hit a low of $1.19 on Wednesday (today it “rallied” and closed at $1.29) as it continues its spiral towards becoming a penny stock, if it was listed on the NYSE (New York Stock Exchange), it would mean possible de-listing of the stock, as Vancouver’s CHC Group (global helicopter company) is now facing for its NYSE:HELI stock that is now hovering at around $0.30 a share (-90% YTD). After my many warnings about the many questionable and poor quality of airline orders for its CSeries, investors and aviation experts are now finally starting to take notice that after 7 years of sales the current minuscule 243 CS100/300 ‘firm’ orders are in fact a whole lot smaller, with many questionable airline orders possibly as low as 130 ‘real’ orders (53% of what is on the books today). Bombardier desperately needs a NEW CS100/300 brand name airline order in the next 30-45 days to prevent the slide of its stock below $C 1.00, as that is the only way in the short term it can gain some investor confidence to stop the stock’s downward spiral. The CS100 is going to be certified in the next 3-5 months, but by then the stock will be a penny stock if no quality new order or some new un-predicted good news is forthcoming soon from Bombardier. The planned IPO of Transportation division in 4th Quarter will raise up to $US 2.5 billion for a 49% sale, but it will most likely impact BBD.B stock negatively, as the trains are 50% of Bombardier’s business, these are desperate times at Bombardier and most Canadians want to see a bright future for this promising company. With 54% of the special voting shares in the hands of the Beaudoin family, new investors are reluctant to be subordinated and a possible hostile takeover is not yet possible. But with the company at a historic crossroad, the possibility of “Combardier” (China’s Comac buying Bombardier), is a real possibility in the next 18-24 months, as this is the only major aircraft OEM the Chinese can possibly buy today, to help them achieve their global aerospace ambitions of being #3 behind Airbus and Boeing, and they are surely watching events in Montreal with great interest. A week ago (August 14, 2015) I wrote my last blog on Bombardier when its stock price (TSX:BBD.B) was at $C1.46, since then it has dropped to $1.19 on August 19th, followed by a jump to $1.27 in a flurry of 8.17 million trades, as investors were thinking it has reached its bottom, yet without any good news on the CSeries program soon, the stock is poised to break the $C 1.00 a share soon, and become a penny stock. Company’s market capitalization today (market cap) stood at $2.87 billion for a $19.88 billion a year in revenue company, at its closing price of $C 1.29 a share, while enterprise value (EV) is $8.23 billion, with EV/revenue of only 0.41 and EV/EBITDA 7.56. Compared with CAE Inc. (flight simulator maker and training company) another Montreal based firm says it all, market capitalization is $3.77 billion for a company with $2.3 million in revenue, EV is $4.84 billion, EV/revenue 2.13 and EV/EBITDA is 10.95. By the way CAE Inc. is laying off 350 employees (280 in Montreal) even though CEO Marc Parent says “our markets have never been better, but it’s time to do these things when you’re in a position of strength”, and the company’s 1st Quarter profit was up 7% to $44.5 million on revenues of $557 million, and yet it will increase dividends by 7% ! so layoff good employees to reward shareholders, what a world. Sadly Montreal’s aerospace industry has been laying off many workers lately from Bombardier, Bell Helicopters and now CAE, what is the future of aerospace in Canada when thousands of employees are being let go at a time when global aviation is experiencing the most unprecedented growth in aviation history ? 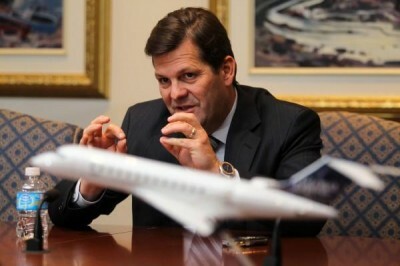 The current desperate situation at Bombardier, is caused by 1. the $US +5.3 billion CS100/300 airliner program (CS100 PHOTO ABOVE LEFT) and 2. the leadership or lack of leadership from ex CEO and now Executive Chairman of the Board, Mr. Pierre Beaudoin (ABOVE PHOTO RIGHT), as the Beaudoin family still controls 54% of the company, the rest of the problems are symptoms of the causes of decline (ABOVE), lack of cash, lack of product development, slowing sales due to a lack of focus on existing markets. The Global 5000/6000 badly needed a revamp to counter the growing threat from Gulfstream’s G650/G650ER, and now the G500/G600, till now no revamp has been be launched, just a 30+% production cut back. The CRJ’s have needed ‘tweaking’ in aerodynamics, interiors and in the GE CF34-8C5 engines for some time now to better compete with Embraer EJets, but no matter what they cannot compete with the new E2’s. The Learjet 85 was cancelled, the Q400 lost its competitive edge to the ATR-72-600, “too much” aircraft for most operators and the new G7000/8000 programs were delayed, due to 3 new programs at the same time (Learjet 85, CS100/300, Global 7000 and Global 8000), which required massive amounts of investment and engineering resources all at once. Bombardier was too focused for 7 years now on the CSeries, and it took its eyes off the other markets and products, like a kangaroo caught at night in the headlights of an oncoming vehicle, they froze and starred at the headlights, mesmerized while various competitors took on the Q400, G5000, G6000 and the CRJ-900 and slowly took over those markets with ‘better’ products, sales, marketing and promotion. New CEO Alain Bellemare is an excellent executive, he is doing all he can, I applaud his efforts, and he has brought in the “A-Team” in sales and marketing, which I have been recommending for a long time, as the ex-deHavilland “oldtimers” just were just not producing positive results. The new team needs time to turn things around, but they are facing many obstacles and time is of essence to produce positive results, but they will bring in new orders, and one of them has to be a US airline, its a must for the future success of the program. In the past week, it has finally come out that the CSeries small ‘firm’ order book of 243 orders is tainted with HIGHLY questionable orders, which I have been talking about for over a year, finally it is being talked about. The lack of quality airlines in the order book is worrying. After Lufthansa (for Swiss), Korean and Braathens one has ‘weak’ airlines, like CS300 launch customer airBaltic ? the Latvian government airline, rescued from bankruptcy in 2010, barely profitable should NEVER be a launch customer for a new aircraft type, but sadly this is a perfect example that Bombardier just has no ‘better’ airline for that very important role, one that can really ruin Bombardier’s reputation from the get go with the CS300. Remember Sukhoi’s fiasco with the SSJ-100 Superjet’s launch customer Armavia (from Armenia) ? well it took the first aircraft but had no money for the second aircraft and went bust, great launch Sukhoi ! what the heck were they thinking ? why was it not Aeroflot ? or Transaero ? anyway, it is what it is, and we shall see what happens late next year. Republic Airways, 40 x CS300 + 40 options – no longer “real” airline, now a ACMI regional for US majors with lots of labor problems, it sold LCC Frontier, thus it has no use for the CS300. SaudiGulf 16 x CS300 + 10 options – major delays in liberalization within Saudi Arabia as national airline Saudia is well protected. It seems Bombardier is racing against time, to get the CSeries certified by this year’s end, at which time the its shares will go up, for if the price falls below $C 1.00 per share, it may be de-listed on the Toronto Exchange, as is the case with CHC Group, the Vancouver based helicopter company I am writing about in my next blog, which has been notified by the NYSE (New York Stock Exchange) that is stock (NYSE:HELI) is not in compliance continued listing standards as that requires a minimum average closing price of $1.00 per share over a 30 consecutive days, it now has 6 months to comply or be de-listed. Certification of the CS100 is now 82% complete, and three certification authorities are involved, Transport Canada, FAA and EASA. 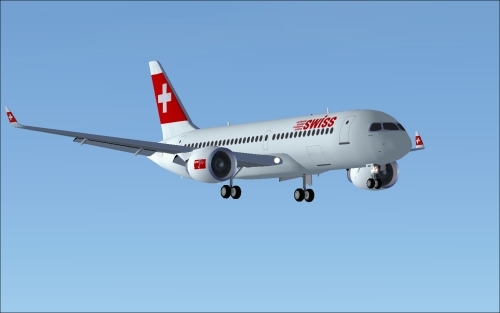 The only way TSE:BBD.B stock will go up by any significant amount between now and the end of the year, is having the CS100 certified this year, for entry into service with Swiss By June, 2016 at the latest. The IPO of Transportation division (trains), is due 4th quarter, and its repercussion will most likely drag the TSX:BBD.B stock down even further as up to 49% of the division may be sold off and raise $US 2.5 billion to keep Aerospace alive until the CSeries aircraft are rolling out the door, but where are the customers is still a big mystery ? Here is the last month of TSX:BBD.B trading a high of $1.95 to a low of $1.19 that is a volatile stock indeed. « SUMMARY: Bombardier’s stock (TSE:BBD.B) hit a new 22 year low again today at $C 1.46 a share, a 62% drop from a year ago, market capitalization is now $C 3.25 billion (less than CAE and just above WestJet Airlines) for a $US 20 billion a year company, that is just unacceptable for any public company. The company just announced a 2 year delay in its new $US 75 million per unit Global 7000 business jet program (already behind by 2 years), right after it announced a 30% production reduction from 80 to 55 units per year of its “cash cow” Global 5000/6000 business jet brand due to a ‘softening’ market globally but also very much due to competition from the #1 OEM in the ultra-long range segment (+/- 48% market share), Gulfstream Aerospace, which is having a very strong sales year (book to bill ratio is 1.0+) with its new G500/600’s and existing G650/G650ER’s , and # 3 OEM (+/- 15% market share), Dassault, with its new Falcon 8X and 5X. Bombardier’s CEO Alain Bellemare is doing a great job keeping the “Titanic” afloat, but 1st half results are worrying, both Commercial and Business Aircraft did have slightly better revenues than last year, BUT most worrying are the Book to Bill ratios (orders/deliveries), Commercial had 0.67 (CRJ line only 0.26) while Business Aircraft had 0.29, in short, both Commercial and Business Jet divisions are seeing very few new firm orders, yet Embraer posted book to bill ratio of 2.64 for its E-Jets (124 firm orders, 47 deliveries) in the first half of this year, the 124 E-Jet orders vs 7 CRJ orders (7 x CRJ-900’s for Mesa) so far this year, says novels about the two products attractiveness, their marketing, promotion and sales, a very serious downward trend indeed for the CRJ brand. Now Bombardier will see deteriorating revenue and cash flow numbers from Commercial and Business aircraft divisions at a time it needs lots and lots of cash, as it “Burned” over $US 1.553 billion in free cash-flow (FCF) in the first 6 months of this year on the CSeries and G7000/8000 programs, and is on target to “Burn” another $US 1.5 billion by year’s end, which wipes away all the new equity and debt it raised in February of this year. An IPO (initial public offering) of Transportation division (trains) is set for the 4th quarter this year which will raise lots of cash (up to $US 5.0 billion for 100%, but only a minority will be sold, most likely to Siemens), so around $US 2.0+ billion is possible as debt is very high at almost $US 10 billion, so where is Bombardier heading ? Many analyst and investors believe there is NO clear path to recovery in sight, while Macquarie Financial lowers BBD.B target stock price to $C 1.00 and yet its own subsidiary, AirFinance (commercial aircraft lessor) has 40 CS300’s on order worth $US 3.14 billion ?? On the bright side, the CSeries is 3+/- months away from certification, and new orders will start coming in after that and the stock will rebound on any positive news. More liquidity is badly needed by 2017, but the Beaudoin family’s control 54% of Bombardier through special class shares, a situation many investors find unacceptable, and many of them may not be lining up next year when Bombardier will need to raise more equity and debt once again, and NOW is the best time for ex-CEO Pierre Beaudoin who created the current mess, and who is now Bombardier’s Executive Chairman of the Board, to go ! It is what is best for the future of the company, as many tough times are still ahead, and there should only be one ‘master’ at the helm at this time as the company’s future is at a crossroad. If it weren’t for the fact that Bombardier is controlled by the Bombardier-Beaudoin family through multiple-voting shares, it would have already fallen victim to a hostile takeover. The market cap of 3.3 G$ for the whole company doesn’t even amount to the accrued development cost of the C Series. Clearly, even in its delicate financial situation, BBD is grossly undervalued. No it is fairly valued. Bbd backlog is $70B (on the high side w/ Aerospace and trains combined). Assuming an optimistic margin of 5%, it’s worth $3.5B in today’s dollars and less over the number of years the backlog is spread over. No P/E, EV or other valuation metrics are reasonable for Bbd because the backlog won’t really grow since the Aerospace business is basically finished (all product lines) and the train business will soon be finished as the two Chinese state companies that merged and the GE/Alstorm merger will run a duopoly. Siemens/BBd JV/merger is basically an absolute must for the two companies just to be able to pickup some bread crums, like Bbd Aerospace might with it’s surviving Global product line. I believe public companies are never over or undervalued. Markets are very efficient and fairly value most analyst-covered enterprises. Valuations change based on new information that comes into public knowledge, such as change in strategy, macro economics, etc. I.e. unknowns. But based on public knowledge, it is fairly valued. I also don’t believe there will ever be a Combardier. Quebec government won’t allow their sale, specially after so many public loans. This is why Quebec is full of dual class share companies. It didn’t even allow sale of RONA, a retailer (like Home Depot), forget about Bombardier. Sale of Bombardier Transportation won’t happen either, even those most those jobs are in Europe. So aerospace, which is mostly based in Quebec , forget it! This company will probably be delisted, and put on life support by the Quebec govt. That’s what everyone’s saying. 0.25-0.5% long term bail out loans from the Quebecois Tax payer. It’s election season and that’s where the Beaudoin family is investing in (campaign funding) rather than investing in its stock as clearly investing in the govt financing option has a better return in their view. You can look at inside trader activity and see no buys from any of the family members. Certification being close was known to potential customers 1-2.5 months ago (and to the public thru online blogs, etc.) and this did not trigger any orders. If any of the potential customers had this as a major purchase factor, orders would’ve come in by now and they haven’t. Certification confidence is high enough so I don’t think simply recieveing an official type certifcate from the authorities will trigger any new order. Something else has to give and it’s discounts for which an additional $5B is needed. Question is, from where?